I promise that I will spend a lot of time with the Red Wedding, but for now let’s take a quick look at a couple of other stories that had some significant implications for the future story. One important development is that Bran finally tells Osha to take Rickon and go to the Umbers rather than taking him to the other side of the Wall. It’s a tender moment between brothers and now means that all of the Starks are well and truly split up. Ironically, this is the episode where Bran mentions that if something were to happen to him or Robb then Rickon would be heir to Winterfell. Rickon departs with Osha in the night, and so we are back on track with the books. Although Osha and Rickon leave much earlier in the book series, having them stay with Bran all the way to the Wall played a role in allowing for a little more character development of the two of them. We now know that them leaving and their story will potentially be a significant part of the future plot – although whether we will see them in the show next season remains to be seen. We also saw Bran slip skins into Hodor to stop him from freaking out over the storm. I got the sense in that scene that though many characters were confused; none were terrified by what he had done. In fact, when Jojen tells Bran that he doesn’t think it’s ever been done before there is a kind of awe and excitement to the delivery. The ability of wargs to take human skins plays a significant role in the future, so I am not sure this moment had as much punch as it should have. Meanwhile we see Jon Snow, just outside of where his brother Bran is hiding, cop a test from the Wildlings and then make the decision to return to the Night’s Watch. It’s been coming, we knew that, and while Ygritte in the book series definitely seemed like a good reason to stay with the Wildlings the shows depiction left little doubt. While I thought that Jon’s escape was well played out, Ygritte’s reaction left me furious. Ygritte is a spearwife through and through. Betraying her and her kind will not have her defend you, or try to save you or stop you. She’s going to put an arrow or knife in you. Tormund actually having to hold her down and convince her that defending a Crow wasn’t worth it was rubbish. In fact, in the book series Ygritte shoots an arrow into Jon’s thigh as he is riding off, which strongly indicates how she feels about the whole thing. As great as Ygritte has been in the show, making her a sap for Jon is something that I cannot forgive. George R. R. Martin certainly is no spokesperson for women but he writes them to be internally consistent and to make strong decisions. Orell takes a sword to the chest courtesy of Jon Snow and I am not sure if viewers noticed but as he died he slipped into the skin of his eagle and then ravaged Jon’s face. I wish the show didn’t keep nearly maiming people. Tyrion’s scar should be much bigger than it is on the show and certainly Jon cops much more than a couple of scratches. Orell’s skin change is significant as his character in the television series is a combination of two characters in the book; Orell and Varamyr Sixskins. It becomes significant to the Warg story I mentioned earlier that Varamyr lives new lives inside the bodies of those animals he slips into. Perhaps Jon hasn’t seen the last of him or perhaps the story will become to complex for the show to handle. Okay, moving onto the Red Wedding. Firstly, although this whole affair in the book made me physically ill when it happened, I didn’t have the same reaction to the show. I hear that a lot of people did so I happily assume that it was well-executed (no pun intended). I know that it might have been that I knew what was coming, but I knew that Jamie was going to lose his sword hand and I still felt just as sick as I had in the book so I don’t think it was that. I think part of it was the pacing. In a Storm of Swords the events happen in a heartbeat and there is no time to consider or reflect. I think the tension built to a point in the show where I couldn’t work out why the characters weren’t slipping away or running in the other direction. I was especially miffed that Catelyn didn’t try to warn someone as she seemed to actually work it out before it happened and certainly had a bad feeling about the whole thing in the book. But let’s talk about the significant developments and changes to the book series and what this might mean moving forward. At the beginning of the episode we see Robb Stark make amends with his mother, the horrendously underused Catelyn. Too little too late, I think, as by this stage in the book series Robb had made amends with her upon hearing about his brothers and the fall of Winterfell. This scene felt a little set up to reintroduce her before her demise. Nonetheless Robb finally admits that Catelyn has valuable insight to offer and, having previously ignored her advice when she was right, asks her about his new plan to take Casterly Rock. This is all good, fair and reasonable. Catelyn points out that if reinforcements arrive from King’s Landing then they will be boxed in between the army and the sea and will surely die... and then Catelyn tells Robb to “take what they love”. Urgh. So Catelyn is a valuable strategic player and then condones something completely stupid after pointing out the risks. This was the perfect opportunity to shift the story back on track with the books and send Robb to the Freys, not for men to go after Tywin Lannister, but to reclaim the North from the Ironborn. Robb Stark is Ned Stark’s son and there is just no way I can buy that he would care about his increasingly weak war of vengeance on the Lannisters over the one thing Ned put before anything else – the North. After that conversation, the Starks deserved to lose - and this is the failing of Robb’s story in the show; he deserves everything that he gets. He’s not the noble hero; he’s an arrogant idiot called the King in the North when he has no North. Robb’s speech and apology to the Frey’s however, was brilliantly executed and gave him a moment to be the kind of King and leader that Ned Stark would be proud of. And Robb’s final wordless look of hopeless farewell to Catelyn as Roose Bolton stabbed him one final time was perfect. I find it difficult to accept that Catelyn stood by and did nothing as she began to work out what was about to take place. Catelyn certainly had time and opportunity throughout the episode to tell Robb that she thought something was amiss as she had in the book. Having said that, I thought that the change to Catelyn taking Frey’s wife hostage was much better than the lack-wit son in the book and her threats were fantastically played, but having her stand there silent after screaming at Robb’s death and then simply being killed doesn’t really sit with me. Again we see another woman who is just too numb to react or process what has happened. The Catelyn of the books instead goes completely insane, raking her nails through her own face and making an attempt on Walder Frey’s life. She goes out swinging and her insanity is very important for what comes next with her character and its memory. How perfect was the casting of Walder Frey? He came off as a smarmy old man indeed but he also came off as a schemer much more strongly than in the book series. His jibes at Robb that he fell for a pretty face rather than fell in love are classic, but moreso were the veiled threats that were concealed in the lusty and lecherous jibes Walder Frey talks about what Talissa has under her cloak but he’s not just talking about a tight body; he’s referring to the heir to the North. A genius addition to the scene, given that her book counterpart, Jeyne Westerling, was not present at the Red Wedding. Here a lot of changes were made. Robb Stark’s wife in the book series was not brought to the wedding on Catelyns advice, in a bid to not further antagonise the prickly Walder Frey. When I saw Talissa walk into the Frey hall I was again hit squarely in the face with the notion that Robb Stark was about to get everything he deserved. Who brings the woman you broke your oath with to the wedding that you are having to make amends for that!? Seriously, Robb Stark is a fool in the show. Additionally, Jeyne Westerling’s family were Lannister bannermen and played a role in the Red Wedding. Jeyne, by association, was part of Robb’s betrayal and demise. That made sense: it was risky for Robb to have married her to begin with, but he did it anyway on his honour. This further instilled the idea that Robb did everything for honour like his father before him. What was the point of changing the story from one of honour and betrayal that made Robb Stark a more robust character to one of love and swooning that made everyone look stupid? There was no point. It’s as simple as that. I had thought that Talissa was actually playing a different character from the book series and that would have made sense and been a fantastic addition to the story but it’s done now and there’s no further speculation on her purpose. Talissa is also pregnant in the show, which is significant because in the book series Jeyne was unable to get pregnant; her mother was actually feeding her moon tea claiming it was a fertility. As a result, with Bran and Rickon believed dead, Tyrion is the heir to Winterfell through Sansa, and so Robb names an heir: a newly legitimised Jon Snow. We never see Robb Stark find out about Sansa’s marriage in the show and therefore he again has no impetus to name Jon Snow heir. Although Jon could still receive a letter saying that Robb did this in secret or something along those lines it would seem like a pretty convenient plot device now. Naming Jon provided the North with security – or at least a Stark. Now it has a Lannister, even if we do happen to like this one – something that Robb would never have allowed to happen. Poetically, Talissa is the first victim of the Red Wedding being stabbed repeatedly in the belly where Robb’s heir would have been growing and driving home the point that there is no Stark heir. Disappointing that the show left out these plot developments, despite seemingly acknowledging the need for them. Why was he at the wedding? I know that a lot of people noted that he was absent when the slaughter began; leading to speculation that he might have been involved. This is unnecessary and confusing given how many different people might be involved in the events of the wedding. In A Storm of Swords, the Blackfish remains at Riverrun as caretaker lord while Edmure is off to be married. I wonder how they are going to explain that away. I guess they don’t really care that it makes no sense for him to be there at all. I really feel that the show runners take out characters and plots to reduce complexity and then in a bid to give characters more face time end up making the plot even more complex or creating non-logical development and plot holes. Hopefully he will reappear at Riverrun next week, having been on the run. 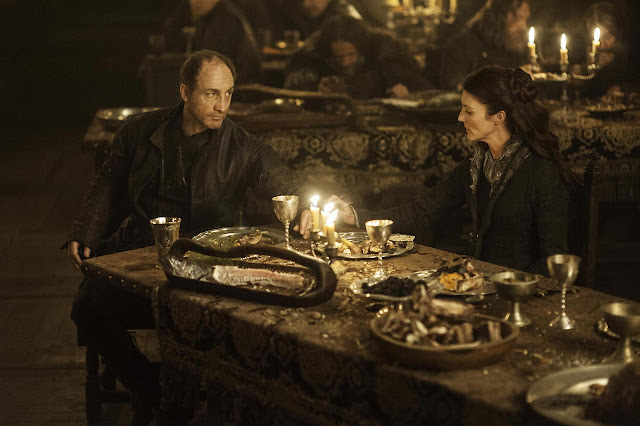 One of the most fantastic changes to the Red Wedding of the book was having Roose Bolton be discovered by Catelyn right before the carnage begins. It gave a really ominous quality to the sequence of events as they unfolded; showing that there was an insider who was betraying them the whole time. Roose Bolton is the one who very visibly ends Robb’s life and spells out that the Lannisters send their regards leaves no misinterpretation that TywinLannister has a hand the plot, and that Roose was the insider. I imagine a lot of people are looking up House Bolton today and Roose will be remembered as the guy who killed Robb Stark. Grey Wind... did they really have to have Arya watch the wolf be put down? And in such a pathetic way? There was no explanation as to why Grey Wind was locked away. The direwolves are bonded to their Starks, and are not likely to be caged or leashed for no reason. In the book, he is chained because he senses that something about the wedding is off and starts snarling at the Freys. Catelyn actually appeals to Robb to trust Grey Wind’s instincts and to be careful about proceeding. A Westerling releases Grey Wind when the butchery begins and he takes out some people even as he is pumped full of crossbows. It’s a much more fitting end to the majestic direwolf who fought by Robb’s side in battle. Did everyone get that it was the Rains of Castamere that started playing when Catelyn started to look uneasy about the wedding? It’s been mentioned and played several times since season one, and Cersei explained the story behind the song to Margaery Tyrell earlier this seasonThe Rains of Castamere is a song about Lannister bannermen that took arms against Tywin Lannister; and had their house wiped out as a result. It is played in the Red Wedding of the book series both inside and outside while the slaughter is taking place; in the show it heralds the impending doom. For the Stark’s it is a song of destruction and for the Lannisters, one of victory. The song had far more meaning, of course, when Robb’s wife was still the daughter of a Lannister bannerman but still packed a punch if the audience realised the connection.